HexaCorp Export selected items to Excel add-in provides an easy mechanism for users to export the selected items from a SharePoint list or library to Excel. The add-in allows the user to export items in Custom lists, Announcements, Tasks, Document libraries, Picture libraries, Asset libraries, Form libraries and Wiki Page libraries. Allows users to export selected items from list or library with all metadata fields. Allows exporting of 100 items in one go. Easily accessible from the list/library ribbon. Displays the number of items selected before export. Works with IE10, IE11, Firefox and Chrome. Support for exporting only the view level fields. Support for managed metadata columns (Single Taxonomy). Support for External data columns. Support to work on Edge browser. This section illustrates how the functionalities present in this app can be used. 1. Navigate to a specific list in the site. 2. Select the item(s) you wish to Export and then click on “Export selected items to Excel” icon which is available in the ribbon under the “LIST” tab. This is shown in the screenshot below. 3. The number of item(s) selected in the list will be shown. 4. Click “Export” to export the selected items to excel. 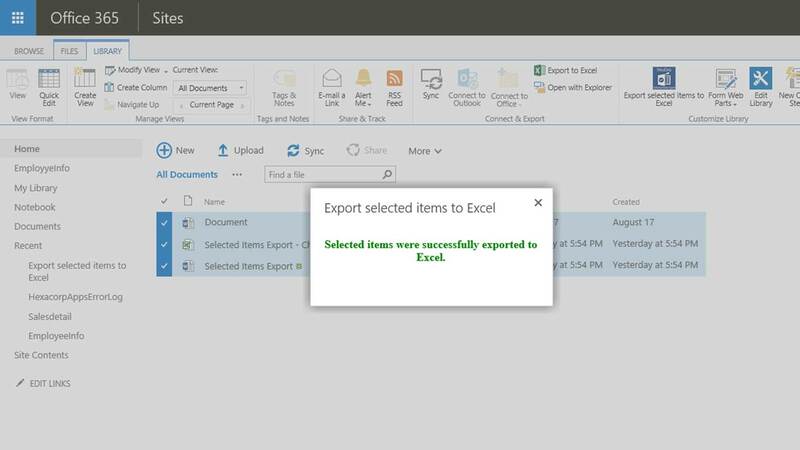 A message will appear confirming that the selected items were successfully exported to excel. 5. Alternatively, click on “Cancel” to cancel the operation. 1. Navigate to a specific library (E.g. Document Library, Picture Library, Asset Library, Form Library, Wiki Page Library) in the site. 2. 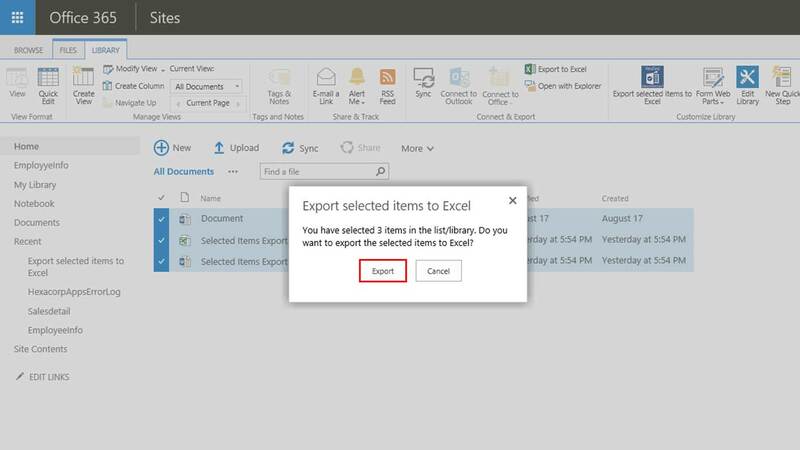 Select the item(s) you wish to Export and then click on “Export selected items to Excel” icon which is available in the ribbon under the “Library”. This is shown in the screenshot below. 2. 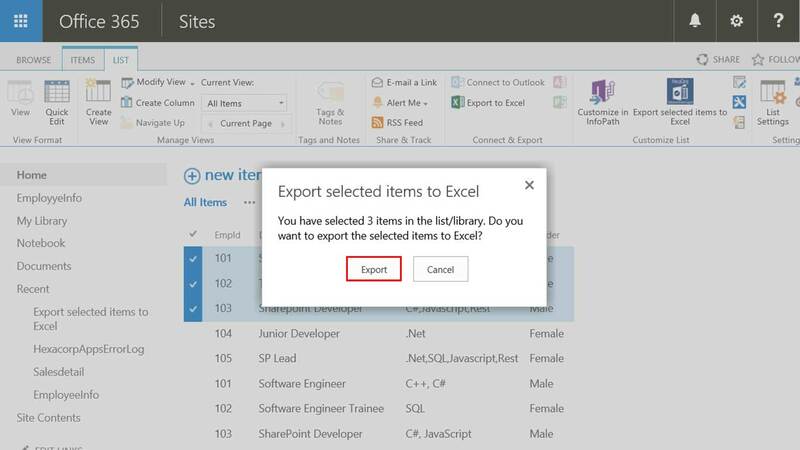 Select the item(s) you wish to Export and then click on “Export selected items to Excel” icon which is available in the ribbon under the “Library”. This is shown in the screenshot below. 3. The number of item(s) selected in the library will be shown. 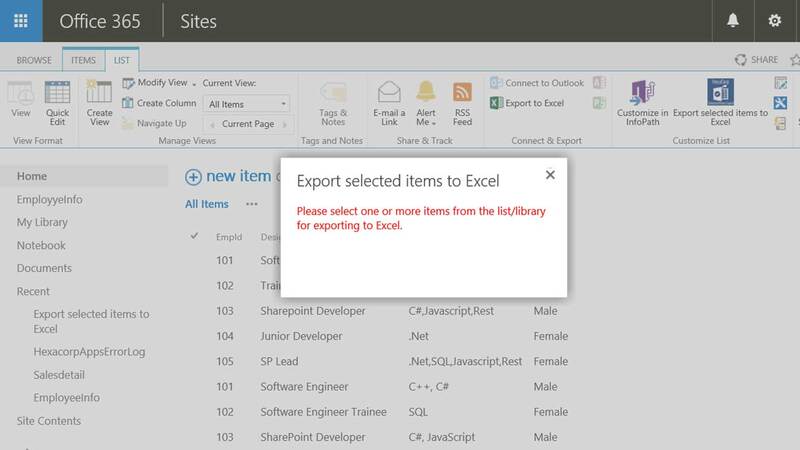 Note: : If the user doesn’t select any of the item(s) in the list or library and clicks “Export selected items to Excel”icon, the message below will appear. Q:1. What is the Export selected items to Export add-in? The Export selected items to Export is a SharePoint add-in that works with SharePoint 2013 and SharePoint Online (Office 365). You can install it from the Sharepoint add-in store. It allows users to export the selected item(s) in Sharepoint list or library. Q:2. Does the “Export selected items to Excel” add-in support all kind of lists and libraries? Yes, it supports Custom list, Announcements, Tasks, Document library, Picture library, Asset library, Form library and Wiki Page library. Q:3. Does the “Export selected items to Excel” add-in export only the view level fields? No, it does not support the view level fields to export. Q:4. Does the “Clear List/Library Items” app support Versioning settings? No, it does not support Managed Metadata (Single Taxonomy) and External data columns. Q:5. What permission(s) do I need to use this add-in? Delete permission is required to use this app. If you have Delete permission for a corresponding custom list or library, you can proceed by clicking the “Clear List/Library Items” icon in the “LIST” tab for a Custom List and the “LIBRARY” tab for a library in the respective SharePoint ribbon. Q:6. How can I solve “This content cannot be displayed in a frame” issue? Step: 1. In your browser go to “Internet Options”. Step: 2. Click on the “Security” option, which will appear in the header of the pop-up window. Step: 5. Next, click on the “Remove” button. Works only with lists of type Custom list, Announcement, Tasks and libraries of type Document library, Picture library, Asset library, Wiki Page library and Form library. Version history details will not be supported.